Now let’s be straight here, power steering is like our silent saviour when driving… who wants to be fighting with a steering wheel every time you need to turn a corner or park? So, unless you want to be doing arm day, well… everyday, then you should do well in treating our silent hero with respect, by keeping on top of its maintenance! So, we’re here to tell you how and why you need to be a watchful guardian to the main component of power steering: the power steering fluid! Why Do You Need To Check The Levels Of Power Steering Fluid? Let’s just think about it, who doesn’t want to extend the life of their vehicle? You’ve spent a hefty sum of cash on it and it’s your responsibility to maintain it. So, along with other preventative maintenance methods you’re probably familiar with, like regular oil changes and tire pressure checks… why not add a power steering fluid level check to your list. Power steering fluid – a type of hydraulic oil that, in simple terms, transmits the power in the power steering system. It’s recommended that you check the levels of power steering fluid every month, to confirm that the fluid is at the right amount and to see if the levels have decreased, which will indicate a leak in the system. If your vehicle groans when you turn and the steering effort seems more difficult than usual, it’s best to check your fluid levels as soon as possible. This is due to the fact that there may be a leak in the system, and if you drive your vehicle for a prolonged period with low levels of power steering fluid, you run the risk of causing serious damage to other components of the steering system, such as the pump and rack. So, you’re doing yourself and your wallet a favour if you catch the leak in advance! 1) Warm up the power steering fluid – First of all, start your car and with the engine running, turn your steering wheel completely to the left and completely to the right a few times, in order to warm up the power steering fluid. This will give a more accurate reading of the level of fluid in the reservoir. Then switch off the engine. 2) Locate The Power Steering Reservoir – If you’re unsure as to where the power steering tank is located, check your owner’s manual. There should be a label on the cap of the reservoir to indicate that it is where the power steering fluid is, such as a mark named ‘steering’ or a steering wheel. 3) Clean The Reservoir – To ensure no dirt particles fall into the fluid when you take the cap off, give the reservoir a quick wipe down with a clean cloth. 4) Remove The Reservoirs Cap – Either unscrew or pop of the cap and place it in a safe location. 5) Check the level of fluid – Some vehicles have reservoirs that are transparent, for example, made of clear plastic, so you will be able to check the fluid level without having to open it. Whereas some vehicles have reservoirs that are made of metal or are opaque, thus you will have to open it to observe the level of power steering fluid. 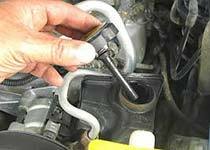 In this case, a level indicator, more commonly known as a dipstick, should be attached to the cap. So when you remove the cap, wipe the dipstick clean with a rag and insert it back into the fluid. Then take it out and observe the fluid level on the dipstick. 6) If necessary, add power steering fluid – Before completing this step, check your owner’s manual for the specific type of fluid used for your car. Once you have the exact type, use a funnel and pour the needed amount into the reservoir, ensuring you do drops at a time to avoid exceeding the maximum amount. If you’re using a dipstick to measure the level of fluid, after pouring a little in, insert the wiped-down dipstick to keep checking the level of the fluid, until the required amount is achieved. As well as the maximum and minimum marks, your dipstick or reservoir may have hot and cold markings too. This is because power steering fluid expands a little when it’s hot, so be sure to use the hot marking when you’ve warmed the fluid up and the cold marking when your vehicle hasn’t been used in a while. Note: If you find that there are low levels, you should take your vehicle to a professional mechanic, as you probably have a leak. 7) Put The Cap Back On – Secure the cap to the reservoir back on tightly. Close the bonnet and you’re good to go! Note: Whilst carrying out these steps, be sure to observe the colour of the fluid and compare it to the new fluid you’re topping the levels up with. If the appearance seems too dark brown or black and contaminated, you may need to flush the old fluid. Doesn’t sound too difficult right? However, if you still feel unsure about undergoing this process yourself, we’ll gladly do it for you! At Power Steering Services, we provide a range of services specifically for your vehicles power steering, so if you decide to come to us, your car will be in good hands! Don’t waste time and call us today for a free quote! Tags : Checking The Levels Of Power Steering Fluid, Guide On How To Check Power Steering Fluid Levels, How To Check Power Steering Fluid Levels, Maintain Power Steering Fluid, Power Steering Fluid Check, Power Steering Fluid Maintenance, Top-up Power Steering Fluid. 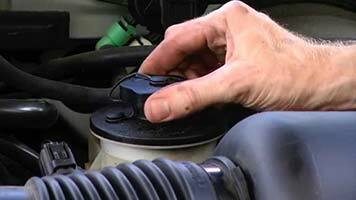 ← Power Steering: Common Problems & How To Fix Them!